I love making jams and preserves. I love the way those jewel-tones jars look, lined up on my pantry shelves. But since most preserves - even chutney - are loaded with sugar, which I'm trying to cut down on. So this year, instead of my usual apricot or plum preserves I've put up a multitude of jars of tomato sauce. The only reason for me to make my own tomato sauce and stock up on jars and jars of it is greed. I don't have a vegetable garden (yet), and commercial canned tomatoes are, for the most part, perfectly fine. And I don't want to make tomato sauce from just any old tomatoes, because what's the point? I wanted to try to capture some of the essence of the gorgeous heirloom tomatoes that I've been indulging in as much as I can this summer. 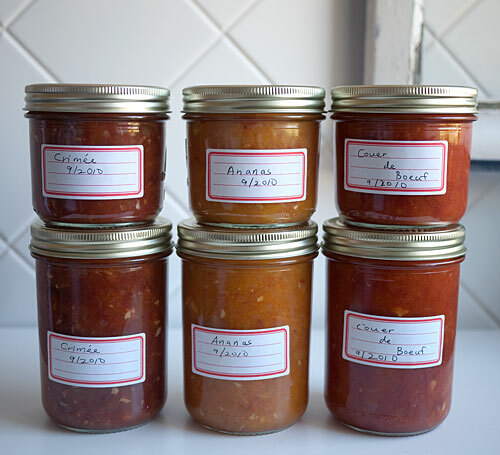 So, that's what I did - make single-variety tomato sauces, from three of my favorite heirloom tomatoes: the rich red, meaty Coeur de Boeuf, the sunny orange Ananas, and the dark burgundy-red Noire de Crimée. Lined up together, they do make a striking display that's just as satisfying to look at as jars of apricot jam. I make my tomato sauce very simply, with minimal additions. Here's the barely-a-recipe recipe. Finely chop the onion, shallot and garlic. Heat up a large, heavy-bottomed pan with some olive oil over medium-high heat. Sauté the onion and shallots until they are transparent. Add the garlic and sauté until the kitchen smells great. In the meantime, prepare your tomatoes. If you wish to peel them, dunk them in boiling water for 30 seconds, then dunk in cold water, and take the peel off. I don't bother with this usually. Cut the tomatoes open, de-seed them then cut up into chunks. Add the tomatoes to the pot, and let simmer until the sauce has reduced by about one third and is a bit thickened, but still has its vibrant fresh color. Salt lightly. Pour into canning jars while still boiling hot, using the directions that came with the jars. You can also freeze the sauce if you wish. Note: I don't add any herbs to this (the usual additions you see are basil, bay, thyme, rosemary etc) because I want the sauce to taste primarily of tomatoes. (You could even omit the onions, shallot and garlic if you wish, but I prefer to keep them in for the added sweetness and flavor.) You can of course add any herb to your taste. I prefer to add a bit of basil on occasion to the finished tomato sauce by drizzling on some basil purée. This is pesto without the garlic, cheese and pine nuts basically. This method requires a food processor. Buy a bunch of basil, or a basil plant in a pot, or use the basil from your garden. Strip off enough leaves to fill up your food processor container with the chopping blade set. Start running the food processor. As it runs, slowly pour in olive oil until it forms a thick, bright green paste. Finish with a little sea salt (optional). Basil purée loses its color as soon as it's heated, so don't try to can this. Put into freezer bags or containers, and store in the freezer. I put it flat into ziplock bags, then break off a bit as I need it. To turn this into pistou, the traditional basil paste of Provence, add some garlic cloves and puree along with the basil. Submitted by maki on 2010-09-13 16:34. Yes I know the handwritten labels for 'coeur de boeuf' are misspelled. It happens. What great timing. I just picked up a few heirloom tomatoes at the market, and I'm always up to try a new tomato sauce recipe. Thanks! Yum, this sounds so delicious!!! I have been loving and eating a lot of heirloom tomatoes as well. What a brilliant idea! An excellent way to showcase the unique qualities of individual tomato varieties. Much like varietal wines and single-source chocolates. Two brilliant ideas, actually - freezing the basil puree flat in zip-locks is genius, too!